We’d love your help. Let us know what’s wrong with this preview of The Death of Mrs. Westaway by Ruth Ware. On a day that begins like any other, Hal receives a mysterious letter bequeathing her a substantial inheritance. She realizes very quickly that the letter was sent to the wrong person—but also that the cold-reading skills she’s honed as a tarot card reader might help her claim the money. Soon, Hal finds herself at the funeral of the deceased…where it dawns on her that there On a day that begins like any other, Hal receives a mysterious letter bequeathing her a substantial inheritance. She realizes very quickly that the letter was sent to the wrong person—but also that the cold-reading skills she’s honed as a tarot card reader might help her claim the money. From the #1 New York Times bestselling author of IN A DARK, DARK WOOD, THE WOMAN IN CABIN 10, and THE LYING GAME comes Ruth Ware’s fourth novel, “her best yet” (Library Journal, starred review). Soon, Hal finds herself at the funeral of the deceased…where it dawns on her that there is something very, very wrong about this strange situation and the inheritance at the center of it. To ask other readers questions about The Death of Mrs. Westaway, please sign up. Kathryn in FL This book has so many holes, it looks it is like swiss cheese. People with common sense should stay away. There was a lock on the door. Two, in fact. They were long, thick bolts, top and bottom. But they were on the outside. This book was so creepy. In a great way. I'm really glad I finally broke down and read a Ruth Ware book. My sister is a huge Ruth Ware fan so I, of course, in true sibling fashion, had to decide I hated her on principal and avoid all her previous books. Okay, I'm joking, but that dirty wench spoiled most of the endings to the others so I have had to bag an arc to be able to read this spoiler-free. And I loved it! Such a delicious, hard-to-put-down mystery. What's not to love about old dark secrets, even older darker houses, and mysterious family legacies? In The Death of Mrs. Westaway, Hal reads tarot cards on Brighton pier and struggles daily to pay the bills and find food to keep her going. This has been her life since the death of her mother a few years earlier. So when she receives a letter bequeathing a large inheritance to her, she decides to accept, even though she knows it must be a mistake. Hal travels down to the English coast and meets her "family". She is taken to the huge, cold and gloomy Trepassen house-- a place that holds a thousand secrets within its walls. It soon becomes clear to Hal that something is not quite right, that she may indeed have a history entwined with the Westaways, and that someone in Trepassen house is determined to keep the past hidden, whatever it costs. Ware builds up to her reveals so well. She had me on a hook the entire time I was reading, pacing the novel just right, gradually pulling back the curtain (and years) on the mystery. She remembers that the whys of mysteries are so much more important than the whos (because, come on, there's only so many people it can be, right?). There's just this overwhelming feeling of wrongness that permeates the novel, and it makes for a very compelling read. Though this is not a supernatural story, the author plays with your mind just enough to have you questioning your own sense of reality and logic. I love the ghostly The Woman in Black vibe, the creepy old housekeeper, and the isolated setting. The cards tell you nothing you don’t already know. It was her mother’s voice, steady in her ear. They have no power, remember that. They can’t reveal any secrets or dictate the future. All they can do is show you what you already know. I especially love how the tarot aspect plays into everything, showing symbolism in everyday objects such as the four cups on the table. As Hal's mother noted, the cards are not magic or psychic, but they do have a way of pointing you in a certain direction, making you notice things you'd ignored before. It was very effective. Ehhhh....is it just me or are all these Ruth Ware novels starting to sound the same? Anybody up for a game of BINGO? "Centered around slow building suspense and tension you could cut with a knife, gothic thriller THE DEATH OF MRS. WESTAWAY is Ms. Ware's most ambitious and entertaining novel to date." All hail Queen Ruth Ware! It's no secret that lady authors have been taking over the psychological thriller scene in the past decade (GiRl PoWeR), but there are a handful that seem to come to the forefront when planning out what we want to read over the summer months. 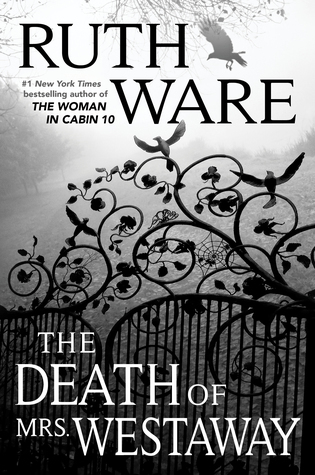 Ms. Ware has been a highly coveted name in rece "Centered around slow building suspense and tension you could cut with a knife, gothic thriller THE DEATH OF MRS. WESTAWAY is Ms. Ware's most ambitious and entertaining novel to date." All hail Queen Ruth Ware! It's no secret that lady authors have been taking over the psychological thriller scene in the past decade (GiRl PoWeR), but there are a handful that seem to come to the forefront when planning out what we want to read over the summer months. Ms. Ware has been a highly coveted name in recent years and for good reason; whether you have read her books from the beginning or are just jumping into her scene, you'll note that she writes a gripping novel with memorable characters and breathtaking atmosphere. While all of her novels would be shelved clearly under the psych thriller persona, this one shined more brightly than the rest, at least in my opinion, due to it's departure into the gothic suspense territory. I'm a huge fan of stories where the atmosphere is as formidable a character as the people who are making the action happen. The Death Of Mrs. Westaway was the perfect example of such a tale, and the oppressive setting ramps up the unsettled feeling in the reader from the very first page. I almost felt that this book gave off some serious Agatha Christie vibes, but with a modern flair. The slow burning mystery portion of the novel was fantastic; it's not so much about the "who" but the "why" and the "how" in this case. The unraveling of what's really going on had a very traditionalist feel to it, and I wholly embraced the slight changes in the story that brought us to a climax that was both intense and gripping. Do you like playing detective, perhaps finding clues along the journey of your reading experience? Then you'll most certainly LOVE The Death Of Mrs. Westaway. The devil is in the details, and that phrase couldn't ring more true than it does in this particular story. I had such a blast trying to solve the mystery in all it's parts and found, while a slow burn through and through, I couldn't put it down due to the story's compulsive nature. Dark, unsettling, and full of unexpected twists, Ms. Ware has created one of the "it" stories of 2018. Highly recommended! *Many thanks to the publisher for providing my review copy. This is one of those books that relies on conversations not had, coincidences, misunderstandings or misexplainations, and a serious dose of people seemingly deliberately taking the least likely option necessitated by the evidence. If, while reading, I have to whisper 'are you serious?' to myself repeatedly as I follow the main character's journey, it is not a good thing. The author seems to have thought out a story then said to herself, how can I make this needlessly messy so it looks cleverer? This is one of those books that relies on conversations not had, coincidences, misunderstandings or misexplainations, and a serious dose of people seemingly deliberately taking the least likely option necessitated by the evidence. If, while reading, I have to whisper 'are you serious?' to myself repeatedly as I follow the main character's journey, it is not a good thing. The author seems to have thought out a story then said to herself, how can I make this needlessly messy so it looks cleverer? Whole sections are entirely unnecessary and the book doesn't know whether it's trying to be gothic horror, Agatha Christie style whodunnit, or psychological thriller, ending up doing none of them well. NEVER BELIEVE YOUR OWN LIES. The Death of Mrs. Westaway is a cleverly crafted atmospheric mystery fueled by deceit. Since I was not a fan of The Lying Game, I was hesitant to read this, but I am so glad I did! Struggling tarot card reader, Hal, aka Harriet Westaway, finds herself in a moral quandary when she receives a letter naming her as a beneficiary in her grandmother’s will. She believes a mistake has been made as her grandparents died long before she was born. Even though she knows NEVER BELIEVE YOUR OWN LIES. Struggling tarot card reader, Hal, aka Harriet Westaway, finds herself in a moral quandary when she receives a letter naming her as a beneficiary in her grandmother’s will. She believes a mistake has been made as her grandparents died long before she was born. Even though she knows that what she is doing is wrong, she is so desperate for money that she decides to travel to the funeral and play the role of the rightful heir. Hal travels to eerie Trepassen House, her “late grandmother’s” crumbling estate. She thinks that she is only going to inherit some money, but she soon learns that she has been left much more. At the estate, she meets her “uncles” and uses her keen observation skills to learn more about the creepy family that inhabited Trepassen. When Hal realizes that she has a legit family connection to these Westaways, she begins to dig for more information which leads her into grave danger. The mystery surrounding Hal’s past kept me intrigued, but it was really Hal’s character that kept me turning pages. Her character is what I loved most about this book. Hal has spent most of her life observing vs. being the center of attention, which has enabled her to master reading people. She can use this skill to deceive, but she has a generous nature. At the same time, she is also fighting to survive and must take what she can. She is often referred to be as being mousy or weak, but her character exemplifies the notion that those who observe are more powerful than those who need to be the center of attention. Trepassen House also plays a large role. The thickly woven atmosphere surrounding the house transported me. Even though the events take place in the current moment, I felt like I had gone back in time while reading this as it is reminiscent of classic mysteries.The tarot card readings and the constant presence of magpies also contributed to this feeling. This is not a book focused on fast-paced action, but rather on slowly unveiling the nuances surrounding the mystery. Subtle clues are planted throughout, but all does not come together until the end. This is a mystery with many layers; I found it to be intriguing, intelligent, and entertaining. I was satisfied with how things played out. The Death of Mrs. Westaway is one of my favorite reads of 2018! I recommend for those who enjoy slow-burn classic mysteries. Ruth Ware writes an eerie, atmospheric and dark twisted murder mystery in the style of the golden age of crime classics with elements of the gothic. 21 year old Harriet 'Hal' Westaway lost her mother in a hit and run car accident, and took up the mantle of becoming a tarot reader at the Brighton Pier. Alone in the world, she is in dire financial straits, owing money to unscrupulous loan sharks, and facing a bleak and unpromising future. Out of the blue, she receives a letter that tells her of an Ruth Ware writes an eerie, atmospheric and dark twisted murder mystery in the style of the golden age of crime classics with elements of the gothic. 21 year old Harriet 'Hal' Westaway lost her mother in a hit and run car accident, and took up the mantle of becoming a tarot reader at the Brighton Pier. Alone in the world, she is in dire financial straits, owing money to unscrupulous loan sharks, and facing a bleak and unpromising future. Out of the blue, she receives a letter that tells her of an inheritance left to her by grandmother, Hester Mary Westaway, which she knows is an error, as both of her grandparents have been dead for a while. Her predicament and circumstances drive her to fraudulently pursue the inheritance, as she attends the funeral and travels to Cornwall to the huge and dilapidated Trepassen House, surrounded ominously by magpies. It doesn't take her long to become aware that something is terribly wrong. This is a story of a dysfunctional family, sibling conflicts and rivalry, intrigue, legacies and buried secrets from the past. This book had me completely hooked from page one! I have to give this 5 glowing stars 🌟🌟🌟🌟🌟 for Ruth Ware—who if I’m being honest never disappoints me! This book was positively haunting!!! It was spooky yet meaningful, with lovely prose and compelling plot twists. I cannot recommend it enough! I finished this book last night. It was one of those books that I stayed up late on a work night to finish, because I was so invested in the story. Hal’s dilemma had me completely immersed in the book. I th This book had me completely hooked from page one! I finished this book last night. It was one of those books that I stayed up late on a work night to finish, because I was so invested in the story. Hal’s dilemma had me completely immersed in the book. I think most readers will find themselves wondering what they would do if they were in Hal’s position! One thing that Ruth Ware does so well in this book (and in her previous work) is to write about characters that are cut off from society in some way. Sometimes this is done through a setting or an experience, and other times it is done through their social predicament. Hal fell into the latter category, with a dash of the first. What I love about the way Ruth Ware isolates characters is how it makes you forget the noise of the rest of the world. It’s easy to put yourself in their shoes, because she writes in a way that their problem is so isolated, that it shines right off of the page. Hal’s predicament felt like it became my predicament! Hal’s strength, worries, and ideas felt like my own. I was able to fully empathize with her, and root for her along the way. The promenade was empty, and the woman had disappeared into the darkness as if made from rain herself. Don’t fall into the trap of believing your own lies. The letter informs Hal that she is set to receive some inheritance from the late Mrs. Westaway, her grandmother. The letter is addressed to Hal by name, and yet Hal knows it cannot be true. You see, Hal knows her grandparents all died long ago on her mother’s side, and the letter references Mrs. Westaway being her maternal grandmother. Still, with debt piling up higher and no chance to repay it, Hal wonders if her career of reading others and telling them what they need to hear might be just the thing to help her play the game long enough to earn a bit of inheritance. As Hal begins her journey to Trespassen House, she finds herself in over her head. It’s one thing to imagine taking a bit of money from those with plenty, but it’s another to place yourself in the center of someone else’s grief. The other Westaways are real people. And yet, there are many secrets in the home. Hal finds herself wondering if she isn’t the only person hiding something. And what will be the cost if those secrets come out? I can feel it—my secret—burning me up from the inside. I have to gush for a moment about the settings in this book. Ruth Ware uses such descriptive language, and this book takes place in some truly fantastic settings. From the spooky, abandoned promenade, to the bare apartment, to the dark mansion—I fell in love with the locations described in this book! I could imagine the settings so vivdly, as though I was there myself. I also loved the opening chapters on Hal’s work in the Tarot booth, and the people and settings she interacts with. I won’t spoil them, but they jumped off of the page for me. The duality in Hal was also a high point for me. Hal is physically meek, but she has an inner strength. The way Hal has learned to play weaker than she is, and then her shows of surprising resilience and bravery were so wonderful. Hal is an easy character to admire and to root for. Hal is someone who has been cast aside in every way, but she has never allowed it to diminish her. Hal is caring but self-preserving. Hal is honest but deceptive. Hal is calculating but impulsive. Many readers will enjoy this book, and I recommend it highly. I am so grateful to NetGalley, to Ruth Ware, and to Gallery/Scout Press for the opportunity to read an advanced copy of this book in exchange for an honest review. One for sorrow. Two for Joy. Three [stars] for Ruth Ware's The Death of Mrs. Westaway!!! Harriet (Hal) Westaway grew up with a loving mother in a tiny flat, until every child's worst nightmare comes to fruition. In one fateful moment, Hal loses her mother and the only security and family she has ever known. Having spent the last few years adjusting to such a life altering change, she has settled into living day-to-day working as a tarot card reader on a pier. Hal is running low on cash, she's go One for sorrow. Two for Joy. Three [stars] for Ruth Ware's The Death of Mrs. Westaway!!! Harriet (Hal) Westaway grew up with a loving mother in a tiny flat, until every child's worst nightmare comes to fruition. In one fateful moment, Hal loses her mother and the only security and family she has ever known. Having spent the last few years adjusting to such a life altering change, she has settled into living day-to-day working as a tarot card reader on a pier. Hal is running low on cash, she's got loan sharks hunting her down like Jaws on Amity Island. Out of nowhere, Hal receives a mysterious letter bequeathing her an inheritance from a wealthy woman she is told is her grandmother. Hal knows an entirely different story of her upbringing, her grandparents and her entire life - she knows this letter was not meant for her. Despite this, her desperation leads her to attending the funeral, attempting to con this family into believing she is who they say she is. From here, things slowly descend into mayhem. You can’t influence fate, or change what’s out of your control. But you can choose what you yourself do with the cards you’re dealt. Hal was by far my favorite part of this story. She was strong-willed, smart, and a genuinely likable character. Mystery / thriller novels fall short for me a bit when they rely solely on interesting over likable characters and I appreciate that Ware didn't fall into the unreliable narrator trope here. Ware did an exceptional job of showing how things snowballed with Hal, and despite making a semi-shifty choice in trying to defraud this family, you could empathize and understand her plight. However, past Hal, none of the characters held much depth for me. The banter between the Westaway family fell flat and I don't feel like there was a lot of development into who they were as people and what had brought them to this point and their animosity towards the situation. This read less like a mystery and more like a family drama but there wasn't enough back story to understand the intricacies at play. We are given Hal's sole POV with a few diary entries from before she was born thrown in. These diary entries are really the only look into the past we get - aside from a few conversations between family members. I would've loved to have seen just a bit more to fully develop that plot line. She had discovered that the most important truths often lay in what people didn’t say, and learned to read the secrets that they hid in plain sight, in their faces, and in their clothes, and in the expressions that flitted across their faces when they thought no one was watching. In the end, this was a disappointment for me because I felt like there was so much promise here and I was a bit let down. The beginning draws the reader right in with intrigue and mystery but this quickly plateaus for what felt like a large portion of the book. Things don't really pick back up until the last 50 or so pages and then I ran into some implausibility issues that suffered due to a lack of development into the character. That being said, the final few twists were a complete knock-out I did not see coming from a mile away! So, here's the thing. You can't really compare Ruth Ware to any contemporary writers. The pure "old-fashioned-ness" of her writing style is so refreshing that it comes across as modern. Weird, huh? You gotta go way back to find Ware's influences. Yep, that's Daphne Du Maurier, Agatha Christie and Patricia Highsmith. These fantastic female authors constructed some of the best psychological suspense novels ever written, but they aren't quickly devoured like a lot of this genre's current output. Fine literature like fine wine requires some savoring time. Sniff, sip and swish this one around your mouth a few times. What's the hurry? Just sit back with your glass, soak up the formidable atmosphere, and enjoy the leisurely experience. This is by far the best of Ware's novels. THE DEATH OF MRS. WESTAWAY is the book I have been waiting for Ware to create!! It is an immediate classic and the story of mistaken identity is an absolute perfect fit to Ware's charming, gothic style. Loved the book, but I did not enjoy the audiobook version. Imogen Church is so wonderful when she is straight reading the book. However, there are numerous characters in this one and the overacted, squealing voices she portrays are just cringe inducing. Also, Ware uses the old diary device prominently in this story and I was confused so many times while listening (is this now? or reading from the diary again?). Ugh, I hate that I can't hear italics!😂😂 I went with Kindle in the end and was so glad I switched. After “The Lying Game” which was a little disappointing to me, I was thoroughly thrilled and engrossed in this new book. Ms. Ware has again written a twisty, dark, atmospheric thriller, this time throwing family, inheritance and sibling rivalry into the brew. Hal Westaway is still reeling from the death of her mother three months previously. She had to forgo her plans to attend college in order to take up her mother’s tarot reading kiosk on the pier in order to pay the bills. Still she fell short and she make an enormous mistake, borrowing money from someone who was beginning to put pressure on her to pay back the loan with lots of interest and even more threats, bodily threats! While dealing with all of this and what her next step will be she gets a letter that she is heir to a substantial inheritance from her grandmother, Mrs. Westaway. Hal never knew that she had a grandmother and really thinks that there is a mix up but as she is pinned against the wall with the threat from her loan shark, she makes the decision to go to the funeral and see what the inheritance is all about. She is hoping for a few thousand pounds to help her get cleared of debt and start fresh. Once at Trepassen house, a falling down, once gorgeous estate, she discoveres that her inheritance is much more than just some money and her “uncles” are none too happy about it, with the exception of Ezra who seems to take her under his wing. The house lends a lot of creepiness to the story, including the terrible attic room which Hal is now sleeping in, with it’s bolts on the outside of the door and it’s message scratched into the window. There are lots of characters quite well developed including the cranky, constantly lurking, Mrs. Warren, who has been the housekeeper since the uncles were children. She seems to know all of the secrets but seems to be biding her time, does she have a secret of her own? Mystery/thriller fans are going to love this new book, I did! The only thing that brought it down to a 4 was the fact that I figured out who the “bad guy” was and most of the mystery long before it was revealed. Still the ending is a great one and I loved every minute of this novel. The Death of Mrs. Westaway is a twisted tale of long-buried secrets and deceptions. Mostly set at a decrepit old estate property where the coldness gets under your skin. I enjoyed the setting most of all. I went into this hoping for a solid gothic atmosphere that would pull me into the story and that's exactly what I got. Our main character, Harriet 'Hal' Westaway, is a young woman down on her luck since the unfortunate hit-and-run death of her beloved mother. One day, believing she has hit rock bottom, a letter arrives announcing that her Grandmother, Hester Westaway, has passed and that she is named a beneficiary in her will. Her presence is requested at the Solicitor's Office during the reading of said will. Harriet, knowing there must be some sort of mistake as her Grandparents died years ago, decides to test her luck and go pretend to be the Harriet Westaway named in the letter, because...what could go wrong? At most she is expecting a small financial payout that will allow her to pay off some debt and perhaps live a little more comfortably. Never in her wildest dreams could she have imagined what would take place once she entered into this dangerous game. I don't want to say too much more regarding the plot as I feel it is best to go into it knowing as little as possible. I will say that the family she meets upon traveling to the Westaway estate, Trepassen House, is eccentric and it was a ton of fun reading the truth unfold. Again, to me the setting and atmosphere of this were fantastic. I could picture the cold, the snow, the eerie lake, the attic room with the bars on the windows; the estate was brought to life within the pages. I live for that in a story. At times, I felt I knew the answer to the mystery and I was correct on parts of it, but it was so twisted it was hard to tell until the final reveal whether I was on the right track or not. Truly a lot of fun to read. I would definitely recommend this book to anyone who likes some gothic vibes weaved throughout their mystery/thrillers. My only slight criticism was that the beginning was a little slow. I had this same feeling while reading, The Woman in Cabin 10, another one of Ruth Ware's books but luckily, for me, the introductory portion of this story didn't drag quite as much as that one. In the end, I am so happy that I picked this one up and I will definitely continue reading Ware's books in future. If this one is any sign, it's that her works are getting stronger and stronger! This was my first Ruth Ware book, but sadly it wasn’t a hit with me. But looking at my friend’s reviews, I do think I might be in the minority with my feelings. I will say that the atmosphere was eerie and perfect. I will also say that the writing and prose was beautiful. But I’m not someone who reads a lot of thrillers or mysteries, but even I could see all the reveals in this one coming a mile away. The Death of Mrs. Westaway is a story of a girl named Hal who has been grieving the loss of her mother for the past three years. She has had to take up the mantle of her mother’s psychic readings and tarot spreads for the community, making ends meet, and barely being able to hide from the loan sharks who she received money from when she was desperate. But she thinks her luck could change the day that she receives a letter, letting her know about the death of a woman she has never known and an inheritance that could not only solve her money problems, but change her life forever. Hal feels like she is good enough at reading people, and telling them what they want to hear, that she might actually stand a chance at convincing them that she is a long lost relative, deserving of a fortune. So, Hal uses the very last of her money to attend the funeral of this mysterious woman she has never known, and travels to the estate, Trepassen. But she soon realizes that her mother has visited this place before, and Hal desperately tries to find out what went on over two decades ago that eventually led to her mother not only fleeing, but to never mention any of her past to Hal. We also are able to see actual glimpses of the past, and events that happened at Trepassen that help piece together everything a bit more. And Ruth Ware is able to add some really amazing, and really creepy, parallels that make you feel really unsettled while reading. Again, the atmosphere of this book is really well done, and I couldn’t help feeling claustrophobic in that attic myself. This all sounds super good right? Possibly haunted house? Unsolved murders? Family mysteries? Tarot readings? But that’s about where the coolness ends; with the premise. Hal leads the reader to believe she is so very perceptive, but she literally ignores every single thing that would help her unravel this mystery. And not to get into spoiler territory, but you couldn’t have paid me enough to stay in that attic! Especially after the light, the window, the attempted murder. Like, Hal just ended up being another, typical, stupid character in another typical, stupid murder mystery. And I’m extra let down because I felt like this had so much potential. And this story wraps up with so many loose ends! What happened to the loan sharks? What happened with the will? What happened with the rest of the family? What were her future plans? Why would a certain somebody help her when they had no real motive? I don’t know friends, but this was just a big letdown for me. Overall, this was just an okay read for me. I didn’t dislike it, but I disliked more things about it than I liked. But again, I am totally in the minority with my feelings based on the Goodreads reviews I’ve been seeing. Another thing I’ll say is that this reminds me of an Agatha Christie novel, another author I’ve never really enjoyed. So, if you do – then I’d probably really recommend this one to you, too! Content and trigger warnings for harassment, anxiety, loss of a loved one, parental abuse, physical abuse, abandonment, captivity, and murder. The Death of Mrs. Westaway by Ruth Ware is a Gallery Scout publication. When Harriet- aka- Hal, receives a mysterious letter informing her that she’s been named in her grandmothers will, and stands to receive a substantial sum of money, she knows immediately a mistake has been made. But, her Tarot Card Booth is not getting the bills paid and her creditors are breathing down her neck, some of which have become threatening. Facing a moral dilemma, with her back against a wall, Hal decides to take The Death of Mrs. Westaway by Ruth Ware is a Gallery Scout publication. When Harriet- aka- Hal, receives a mysterious letter informing her that she’s been named in her grandmothers will, and stands to receive a substantial sum of money, she knows immediately a mistake has been made. But, her Tarot Card Booth is not getting the bills paid and her creditors are breathing down her neck, some of which have become threatening. Facing a moral dilemma, with her back against a wall, Hal decides to take a chance and test the water by attending the funeral of her ‘grandmother’ – Mrs. Westaway. Well, I suppose it was bound to happen. 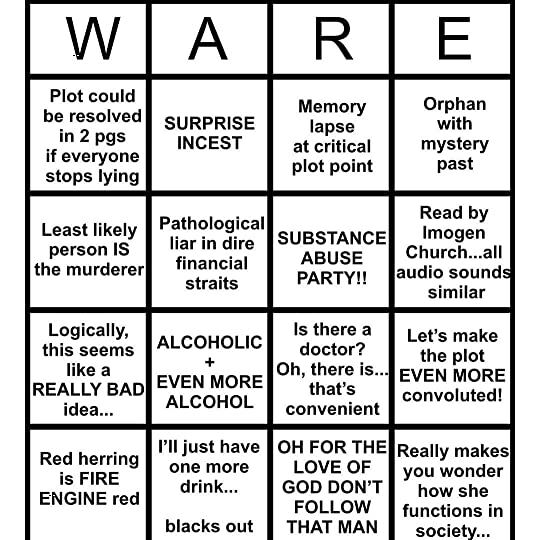 I’ve really enjoyed Ware’s previous novels and I see that this one has been well received for the most part. But, for me this one was a bit flat. It took me an age to get into the story, and the tried and true attempts to build suspense, were too obvious to be effective. By all accounts, this book should have been right up my alley. The old house, the creepy housekeeper, the gathering of the suspects, and the moral issues are all elements I love in a good mystery/suspense novel. But, the pacing was just too slow, the characters were uninteresting, and the dialogue was a bit dull. I can’t really explain why this book didn’t resonate with me, but I just couldn’t get into it. The Magpie references seem to be a popular theme in books right now, but this time it didn’t impress me, and I mainly found it distracting. I guessed major parts of the mystery in advance, so the only thing propelling me forward was seeing how Hal discovered the truth and how it would come to an end. After giving it a few days, I think maybe it was more of a ‘it’s not you, it’s me’ situation. I was excited about the book, and the plot was original, but, it just didn’t grab me. It was okay, and I see why most of my GR friends loved this one. I’m disappointed that I can’t seem to muster that level of enthusiasm for the book, but believe me, it wasn’t from a lack of trying. First and foremost, I'm happy to say that RUTH WARE IS BACK! I've been a fan of Ruth Ware since Day 1. In a Dark, Dark Wood was such a good debut light-mystery novel and The Woman in Cabin 10 was one of my favorite mystery novels of all time. After my disappointment with The Lying Game, I still was hopeful for The Death of Mrs. Westaway . Ruth Ware went back to her roots with The Death of Mrs. Westaway and created a robust, multifaceted, and fascinating story. Seriously guys, I read this 360+ First and foremost, I'm happy to say that RUTH WARE IS BACK! I've been a fan of Ruth Ware since Day 1. In a Dark, Dark Wood was such a good debut light-mystery novel and The Woman in Cabin 10 was one of my favorite mystery novels of all time. After my disappointment with The Lying Game, I still was hopeful for The Death of Mrs. Westaway . Ruth Ware went back to her roots with The Death of Mrs. Westaway and created a robust, multifaceted, and fascinating story. Seriously guys, I read this 360+ page book in one sitting! Harriet (Hal) Westaway is a young twenty-something year old tarot card reader in Brighton, England. She is struggling to pay the bills; barely making rent while her business is providing dismal financial stability. With loan sharks out to enforce their illegal and exploitative payment plans, Hal is looking for a light at the end of the tunnel. Her mother died years ago, and she has no family to lean on—she is utterly alone. As Hal checks her mail, she receives notice that her grandmother, Hester Mary Westaway, has recently passed away and has left Hal an inheritance of some kind. Hal believes this to be a clerical error of some kind because her grandparents have been dead for years. Desperate, Hal decides that she can fraudulently try and claim this inheritance as her own—she's been conning innocent people for years as a tarot card reader and this will just be another gig for her. When Hal arrives to the Westaway family home, she quickly finds herself immersed in a rich family history that quickly starts to crumble. Something is wrong with this family, but Hal just can't seem to grasp what is so concerning. In a world of family dynamics, betrayal, and greed; The Death of Mrs. Westaway delivers a realistic mystery crime-fiction novel that will keep you hooked from page one. I know it's lame to compare author's works to each other, but in order to show the reasoning behind my five-star rating for The Death of Mrs. Westaway , I'm going to have to tell you how this story differs from Ware's other works. At its core, The Death of Mrs. Westaway provides a lot more atmospheric undertones than anything she's ever produced. Its gothic atmosphere provides a higher level of suspense that I have yet to see in anything else. This story is a lot more dense than In a Dark, Dark Wood and The Woman in Cabin 10; you can really see the progress Ruth Ware has made in her writing and she continually fine tunes it in this story. For about a good 30% of the book, we have the characterization of Hal set perfectly. At first, I immediately felt that this was going to be a slow burn novel, but I was wrong because everything comes full circle. We see Hal's desperation come to life and her willingness to deceive to survive. Hal is not the typical alcoholic unreliable narrator that we have come to grow tired of in every suspense novel that has been published since 2015. Hal is entertaining and honestly refreshing. When we meet the secondary characters, they are all unique and interesting in their own way. Each character in The Death of Mrs. Westaway is fully developed and multi-dimensional. After reading the synopsis, throw everything you think about Ruth Ware novels out the window. The Death of Mrs. Westaway will keep you guessing until the very end (seriously, I thought the story was winding down and was completely thrown off by the end). Thank you Scout Press/Gallery Books for my advanced copy in exchange for an honest review. The Death of Mrs. Westaway will be released May 29, 2018. (3.5) The gothic ambience in the Trespassen house was perfect for all the family secrets. You'll spend the whole book trying to figure if/how the main character is related to everyone and who's lying! I received an ARC from the publisher via NetGalley in exchange for an honest review. 2.5 stars! Ruth Ware in my opinion has the absolute best sinister, gothic, and enticing covers ever! They have always grabbed my attention and gave me that feeling that I just HAD to read the book. It is just too bad that my excitement didn’t follow through to the end of this story though. THE DEATH OF MRS. WESTAWAY by RUTH WARE is a slow-building, dark, atmospheric, and gothic mystery that had me somewhat engaged, entertained, and interested enough throughout this book to keep me turning those 2.5 stars! Ruth Ware in my opinion has the absolute best sinister, gothic, and enticing covers ever! They have always grabbed my attention and gave me that feeling that I just HAD to read the book. It is just too bad that my excitement didn’t follow through to the end of this story though. 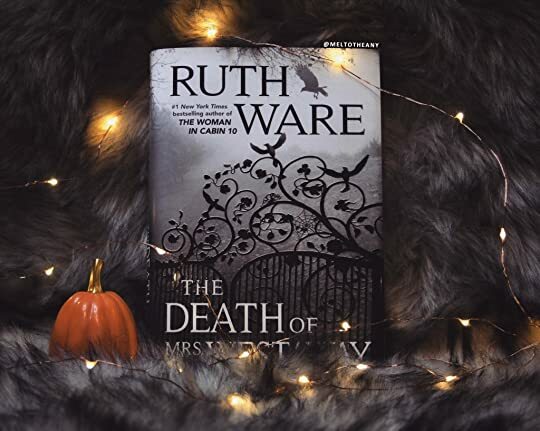 THE DEATH OF MRS. WESTAWAY by RUTH WARE is a slow-building, dark, atmospheric, and gothic mystery that had me somewhat engaged, entertained, and interested enough throughout this book to keep me turning those pages but I was never truly invested in this story though. When reading a thriller &/or suspense novel I like to be able to work out the why and how and be pleasantly surprised by the little pieces of puzzles that were left along the way that I either missed or didn’t think were important to the twists or reveals. I thought some pieces of that puzzle were left out here and in some instances didn’t match-up so therefore this novel just didn’t work for me. I also had a little problem with keeping all the characters straight as they all just seemed to roll up into one and it was really hard to differentiate between who was who, which I found rather distracting. I will say though that I absolutely loved the setting of creepy Trespassen House and the atmosphere of this novel though! I also thoroughly enjoyed Hal and her tarot card readings. I thought the explanations and the meanings behind the cards were quite thought-provoking and had me really interested. However, unfortunately it wasn’t quite enough to make this story really work for me. Even though I feel like I wasn’t quite the right reader for this one, I still recommend giving it a try! Thank you so much to NetGalley, Simon & Schuster Canada and Ruth Ware for the opportunity to read an advanced copy of the book in exchange for a review! Review written and posted on our themed book blog Two Sisters Lost In A Coulee Reading. 4.5 stars, rounded up. Read with the Traveling Friends group, this made for a fun discussion as we tried to piece together the clues and solve the mystery. And what a twisty, fantastic story it was! An old crumbling estate, a malevolent housekeeper, a dysfunctional family, long-held family secrets, missing people…. all elements that I love in a tale that oozes a menacing gothic atmosphere. The story opens with 21-year-old Hal, who was left all alone in the world 3 years ago after her mother’s deat 4.5 stars, rounded up. Read with the Traveling Friends group, this made for a fun discussion as we tried to piece together the clues and solve the mystery. The story opens with 21-year-old Hal, who was left all alone in the world 3 years ago after her mother’s death. She was forced to set aside her plans of college and took over her mother’s job as a tarot card reader. Hal has difficulty making ends meet and has fallen victim to a loan shark, leaving her desperate. Her fortunes seem to take a turn for the better when a mysterious letter arrives. Hal has been named as a beneficiary in her grandmother's will. Too bad Mrs. Westaway isn’t her grandmother, but from her tarot card reading and dealings with the public, Hal knows how to read people and situations and is confident she can pull off the deception. What’s the harm in playing along and walking away with just a little money to help her through this rough patch? Hal hops on a train to attend the reading of the will and ends up staying with the Westaway family. From here, the tension and suspense made this an addictive read that I had difficulty putting down. I loved how the author dropped clues like bread crumbs throughout the novel, but it wasn’t until the end that the puzzle pieces clicked into place. I thought I had it figured out but turned out to be only partially right. I was pleasantly surprised - well done Ms. Ware! First, I want to point out that stunning Gothic book cover: bleak foggy weather, black iron gate, and menacing magpies looming overhead... It fits this dark, atmospheric tale perfectly! Harriet Westaway, who goes by Hal, ekes out a living as a tarot card reader on the pier in Brighton. Hal is alone in the world, and life is a struggle, especially during the off-season when clients are scarce. Things are pretty bad for Hal, until one day she receives a letter telling her that she's been named as a beneficiary in her grandmother's will. However, the deceased Mrs. Westaway isn't her grandmother - but does that really have to matter? This was an eerie, suspenseful, and well-written Gothic mystery. I could definitely see influences from Daphne du Maurier's Rebecca (which I loved). I enjoyed trying to figure out how Hal's puzzle piece fit in with this haunted family. The sinister atmosphere and delicious twists kept me glued to the pages. 4.5 stars! This book follows the story of Hal; She has no family, she lives alone in a decaying flat, she makes her money by tarot reading during the day, she's mainly broke and she owes a lot of money to some loan sharks. When Hal receives a mysterious letter addressed to her- a letter concerning an inheritance- she is keen to find out more. She realises the letter was sent to the wrong person, however, through her Debating between 3-4 stars. This book follows the story of Hal; She has no family, she lives alone in a decaying flat, she makes her money by tarot reading during the day, she's mainly broke and she owes a lot of money to some loan sharks. When Hal receives a mysterious letter addressed to her- a letter concerning an inheritance- she is keen to find out more. She realises the letter was sent to the wrong person, however, through her skills as a tarot-reader, she hones in on her reading ability to help her claim some money. Through this she goes on a journey to the gothic mansion of Trepassen; the home of the late Mrs. Westaway- creepy, mainly uninhabited, dark, with few working lights and no central heating. During Hal's time at Trepassen she meets a whole host of a dysfunctional family, she learns more of the strange situation and the inheritance at the centre of it. Through out this book secrets are unpeeled and unveiled unto the last few chapters where all the pieces of the puzzle fits into place. Ruth Ware does a great service to describing the creepy tone of Trepassen house. I found it similar to the haunting descriptions of Manderley ,from the book Rebecca, as well as those featured in classic literature. Hal was a brilliant character; completely down on her luck, a loner and isolated. However, I found Hal very fascinating due to the knowledge I gained about tarot reading. Another well drawn character was that of Mrs Warren; highly strict and completely unappealing as a character- she comes across as a villain, mirroring the persona of Mrs Danvers (again from the book "Rebecca" by Daphne Du Maurier). Well, she most definitely did. Some very convoluted bloodlines and twists and fate doing a lot more than could have been expected. A lovely novel. Hal was used to reading between the lines, deciphering the importance of what people didn’t say, as much as what they did. It was her job, in a way. But the unspoken words here required no decoding at all. They said, We know where you work. We know where you live. And I thought—This is it. This is what I have been waiting all my life to feel, this is what those girls at school used to talk about, this is what the songs mean, and the poems were written for. This is it. He is it. 5 stars! The chilling and eerie atmosphere in this novel was like a character of its own! It didn’t take long for me to feel completely immersed in this haunting tale. The damp and dark weather. The old, crumbling mansion. The family full of lies and long hidden secrets. This is my kind of book! I have read every one of Ruth Ware’s novels and this is by far, my favourite! This book revolves around twenty-one year old Harriet Westaway “Hal”, who took over her mother’s tarot card reading business 5 stars! The chilling and eerie atmosphere in this novel was like a character of its own! This book revolves around twenty-one year old Harriet Westaway “Hal”, who took over her mother’s tarot card reading business after she passed away three years ago. Years of being alone and struggling to pay the bills have left Hal frustrated and desperate. One day, she receives a mysterious letter advising that she has been left a substantial inheritance from Mrs. Westaway, a grandmother she has never heard of. Hal travels to the Trepassen House estate where she meets the family of Mrs. Westaway. The writing was perfection! I was glued to the pages from start to finish! Ruth Ware kept the tension, mystery and suspense building as each page turned, all the while keeping the dark and unnerving atmosphere brooding. Each character brought forth a new aura of intrigue and secrecy. A big thank you to NetGalley, Simon & Schuster Canada and Ruth Ware for providing me with an ARC in exchange for an honest review! Although there were many things I liked about this one, it did not live up to my expectations. I just loved Woman in Cabin 10, but didn't really enjoy The Lying Game. I'll try to explain why this fell flat for me. I thought the premise was mysterious and intriguing - a letter about an inheritance that was sent to the wrong person ( I was imagining all kinds of sinister scenarios). The mystery turned into a messed-up family drama with confusing side stories and was lacking suspense. I did enjoy the gothic undertones and the mansion, but just felt that they were never really utilized in creating the dark mystery I was craving. I found it too slow and not so clever, but many enjoyed this one. So read all the reviews and you may find it works for you! Norma and I started off lost in a coulee with five of our Traveling Sisters. By the time we finished this story we ended up in different coulees with how we felt about this story. Norma and I were left in the our heads are spinning barren coulee with 2 sisters, while three sisters were left sleepy from staying up all night and dancing in the garden lush coulee. Ruth Ware does a great job of creating an engaging and intriguing story, and this story had all the elements to make it an interesting story for us all. We loved the gothic feel, the old mysterious mansions with creepy rooms that hold secrets, a shady family with an inheritance and one of our favorite characters an angry and unfriendly housekeeper. Lots of creepy good to this story. We all started off intrigued and really liked our interesting main character tarot card reader Hal. We all soon grew to like housekeeper Mrs Warren who really gave a mysterious creepy feeling to the story as well for us. We soon meet the shady family members and that's when we started to go our separate ways in the coulee. For some of us, our heads started spinning in confusion with trying to piece together who is who and who is connected to who. We were engaged enough in the story to hold our attention till the end, however, we just gave up trying to put the pieces together. For the rest of the sisters, they found it exciting and intriguing putting those pieces together and couldn't put the book down till they were done. Leaving them reading to the wee hours and feeling a little book hangover the next day. In the end when we all came together for our final discussion as we tried to piece everything together and our heads kept on spinning till one sister rescued us with helping us figure it all out. The Death of Mrs. Westaway lead to a fun, entertaining and interesting discussion and for that reason I recommend for group discussion. This is Traveling Sisters GR Reading Group Review and it can be found posted on our themed book blog Two Sisters Lost In A Coulee Reading. I don’t read a lot of mystery books but the premise of The Death of Mrs. Westaway really intrigued me. Hal, a struggling tarot card reader who is in financial trouble, receives a mysterious letter describing an inheritance she is owed from a distant relative, her grandmother, Mrs. Westaway. It seems too good to be true and she knows it’s likely a mistake, but Hal is desperate and curious, so she makes the trip to see what this is all about. Upon arriving, she meets 3 uncles she was unaware of - H I don’t read a lot of mystery books but the premise of The Death of Mrs. Westaway really intrigued me. Hal, a struggling tarot card reader who is in financial trouble, receives a mysterious letter describing an inheritance she is owed from a distant relative, her grandmother, Mrs. Westaway. It seems too good to be true and she knows it’s likely a mistake, but Hal is desperate and curious, so she makes the trip to see what this is all about. Upon arriving, she meets 3 uncles she was unaware of - Harding, Abel and Ezra, in addition to Harding’s wife and children, Abel’s partner, and the family’s longtime housekeeper, Mrs. Warren. The group ends up staying at Hal’s grandmother’s home - A large, old rundown estate. Once there, Hal tries to play her part, innocently, while also trying to subtly uncover family secrets. There’s a lot of tension and mystery swirling around the estate and the family’s history. I had no trouble picturing the gothic, creepy scene of Mrs. Westaway’s estate due to the great descriptions included in the story, which was a slow burn, yet I enjoyed the build. I can appreciate setting the scene appropriately but feel like the story didn’t really pick up to the height of the mystery until the final third of the book. I’m generally not a fan of mysteries - I think because I find them to often be too predictable, far-fetched, and have convenient plots or sequences of action. I had a few predictions of what was going on in The Death of Mrs. Westaway. Although I wasn’t far off, my predictions weren’t correct which also made the story enjoyable. The mystery was well-crafted and kept me intrigued. The cover of “The Death of Mrs. Westaway” is perfect to draw the reader into Ruth Ware’s new book. The gothic sense of creepiness from the cover is further enhanced by the evocative descriptions of the crumbling old mansion Mrs. Westaway lived in. And then there are the characters - what brilliantly conceived characters! Hal, who believes she has no living relatives receives a letter informing her that she has received a bequeath from her Grandmother. Curious and in desperate financial 3.5 stars. This is going to be a very biased review because I love all of this author’s books. Hal (or Harriet) is a tarot-card reader who receives a letter bequeathing her an inheritance. She knows she is not the person the letter is addressed to but she could definitely benefit from claiming this money. Soon, Hal heads to the address on the letter and what she finds and who she meets is not what she expected at all! Wow, this was an excellent novel mostly set in Trepassen, an English countryside mansion. The estate is almost a character in itself, an old, large, gothic house that holds many secrets. The writing, story, and characters were skillfully crafted and hooked me from the first page. Overall, I loved it!!! One for sorrow, Two for joy, Three for a girl, Four for a boy, Five for silver, Six for gold, Seven for a secret Never to be told. The opening lines of the story are enough to pull you right in the story & The Death of Mrs. Westaway does just that. The cryptic verse & the novel’s opening set on a dark and stormy night sets the tone for the rest of the book and makes you want to read right till the end. Hal is an orphan, living on her meagre income as a tarot reader. One day, she receives a mysterious letter bequeathing her a substantial inheritance. Unable to trace her relationship with her mysterious benefactor —but in dire need of money, she decides to claim it anyway. Soon, Hal finds herself at the funeral of the deceased…where it dawns on her that there is something very, very wrong about this entire situation and the inheritance at the centre of it. The premise of the novel itself was mysterious and intriguing - a letter about an inheritance from a mysterious benefactor and Ruth Ware does a great job in setting the sinister tone for her story. It reminded me of the old manors in Agatha Christie’s mysteries. The old haunting manor, the almost-evil housekeeper, a bunch of unknown relatives, even the creepy magpies and the constant dread that something going to go horribly wrong very soon.....Ware gets the setting of the creepy Trespassen House and the atmosphere of this novel absolutely spot on. In addition to its brooding atmosphere and the ‘mistaken-identity’ story, the novel also gives us a heroine of real depth in Hal. Hal, despite her many questionable decisions, is a likeable character. Now just like the mistaken identities, while I was expecting to read a murder mystery or even a horror-thriller, but this turned out to be more of a family drama. The story started off slow and I was expecting it to pick up as it went along (and it did… right towards the end) but I felt it was a bit slow for a mystery. Also the writer gives away far too many clues along the way. Even if you choose to ignore the clues, you will have no trouble guessing the final mystery. Infact, you will a bit frustrated that none of the characters is unable to put together the clues that are right in front of them. So, the final few chapters are thrilling but a bit predictable as a result. You never feel the tension rising at any point in the story, except at the end. In a way, I felt that the atmosphere and the brilliant setting was never really utilized in creating a perfect mystery. In every Agatha Christie’s mystery, apart from the atmosphere, we get a bunch of creepy characters, where almost everyone is a suspect. Unfortunately, most of the characters are not even remotely creepy. None of the characters had much depth. Everyone is so polite and warm towards Hal, you almost feel guilty for doubting them. It was also difficult to keep track of all the other characters in the novel. Apart from the characters, there are a few entries from a diary, from before Hal was born. These diary entries, though a nice touch, reveal either far too little or far too much of the mystery, at various points in the story. On a cold stormy day, inadequately dressed for the weather, Harriet "Hal" Westaway stood at the gravesite of Hester Westaway at St. Piran's Church. Having received a mysterious letter from solicitor Robert Treswick, Hal as the "assumed granddaughter" of the deceased needed to pay her respects as well as claim her bequest. After the funeral service, the Westaways traveled to Trepassen, the family estate in the English countryside of Cornwall. The gloomy, eerie manse was crumbling and aggressive m On a cold stormy day, inadequately dressed for the weather, Harriet "Hal" Westaway stood at the gravesite of Hester Westaway at St. Piran's Church. Having received a mysterious letter from solicitor Robert Treswick, Hal as the "assumed granddaughter" of the deceased needed to pay her respects as well as claim her bequest. After the funeral service, the Westaways traveled to Trepassen, the family estate in the English countryside of Cornwall. The gloomy, eerie manse was crumbling and aggressive magpies were frequent inhabitants of the homestead. Hal was between a rock and a hard place. Upon the death of her mother three years ago, the once confident twenty-one year old was now pale and skinny, always hungry. "The person she was now was not the girl she would have been". By necessity, Hal had taken over her mother's kiosk, a little booth on Brighton's West Pier. "Madame Margarida"-specialist in Tarot, Psychic Readings and Palmistry. Hal was best at cold reading. She could read the secrets people hid in plain sight, on their faces or by the clothes they wore. These skills would come in handy because Hal was about to perpetrate a fraud. She was certain she received the solicitor's letter in error. Hal was drowning in unpaid bills. In addition, she was being stalked by loan shark, Mr. Smith. Threats of bodily harm included broken bones and teeth if the loan was not repaid, with interest, within the week. What choice did Hal have? The dysfunctional Westaway "uncles" consisted of Harding, who interrogated Hal military style, Abel, the friendly sort and Ezra, who was often uncommunicative. Hal's "aunt" Maud, Ezra's twin, left home twenty years ago never to return. The Westaways were not happy growing up with manipulative, uncaring mother, Hester. Unfriendly housekeeper Mrs. Warren ran the household with unwavering sarcasm. Upon arrival at Trepassen and needing to stay until the reading of the will, Hal was shown to the attic room which contained bars on the windows and two locks bolted on the outside of the attic room door. "The Death of Mrs. Westaway" was chock full of deception. Everyone had secrets including the sinister Mrs. Warren. Why were the siblings always sparring? What was it like to have experienced childhood in Cornwall's Trepassen estate? Author Ruth Ware has created a masterful goth atmospheric novel replete with stark, stormy weather. The twists and turns experienced by the excellent fleshed out characters make for nuance and unease as the mystery unfolds. Kudos to Ruth Ware. It's all in the cards......or is it? Harriet "Hal" Westaway settles into her small booth on the pier in Brighton. She palms the Tarot cards across the table for another customer. Truth be told, Hal eyes each individual for clues into their current situations. The future doesn't always come easy and the cards often set up in contrasting ways. Hal recognizes that long face of desperation. She sees it on a regular basis on her own. Icy rain coats the boards of the pier as she makes her way home. Once inside, there's not much difference in her apartment's temperature as it is outside. Overdue bills pile up and a near empty bank account leans into her world. Hal's also being hounded by a snaggled-nosed heavy who threatens her with bodily harm if she doesn't come up with the latest installment on her back street debt. Life's not lookin' too good about now. But among the tombstones of debt is a letter that Hal doesn't recognize. Shaky hands open the envelope. An attorney requests Hal's presence at the funeral of her recently deceased grandmother at the Trepassen estate. Funny thing......her grandmother has been dead for many years and Hal has no living relatives. But hey, who could pass on a possible inheritance that may lift Hal out of her valley of debt? Ruth Ware presents another storyline showcasing a female main character at her wit's end as she did in The Woman in Cabin 10. I really enjoyed that one. The character of Hal, in this one, reflects more of an unworldly young woman who has been prone to bad judgments. Her mother was killed in a hit-and-run accident outside of their apartment building. It is her mother's Tarot cards and pier business that Hal steps into after her death. She seems to always be on the receiving end of the decisions made by others. Ware wraps her story in the gloom and doom of the Trepassen estate. Hal's struggle with her conscience vs. the truth is woven throughout. Ware also complicates the storyline with diary entries from 1994 that will reach into the present. There's a bevy of characters here that emphasize the fact that not all these fish wish for Hal to be swimming in their pond. An entertaining read that certainly takes the long, winding road through this village. It does get a bit draggy here and there. But all in all, the chilly estate and the snarky housekeeper make up for it in aces. Ruth Ware grew up in Sussex, on the south coast of England. After graduating from Manchester University she moved to Paris, before settling in North London. She has worked as a waitress, a bookseller, a teacher of English as a foreign language and a press officer. She is married with two small children, and In a Dark, Dark Wood is her début thriller. Find her on twitter at www.twitter.com/ruthwarew Ruth Ware grew up in Sussex, on the south coast of England. After graduating from Manchester University she moved to Paris, before settling in North London. She has worked as a waitress, a bookseller, a teacher of English as a foreign language and a press officer. She is married with two small children, and In a Dark, Dark Wood is her début thriller. “Never believe it, Hal. Never believe your own lies.